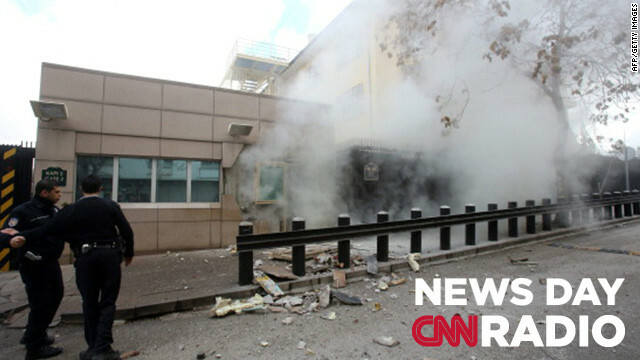 People stand outside the entrance of the US Embassy in Ankara just after a blast on February 1, 2013.
" There is no shortage of groups inside Turkey who have an ax to grind, against either or both, the U.S. and Turkish governments." "One of the ways that you can increase profits is by getting somebody else to build you a new arena or stadium. And one way that the team owners have found success at doing that is to threaten to move." "The most important thing about Grand Central I think, is that it is a functioning railroad station. And it functions extremely well."